Mar 9, 2014; Brooklyn, NY, USA; Brooklyn Nets point guard Jorge Gutierrez (13) during the fourth quarter against the Sacramento Kings at Barclays Center. Brooklyn Nets won 104-89. 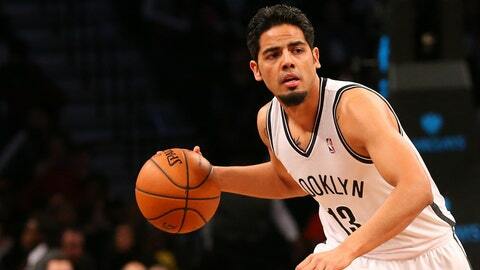 Former Canton Charge guard Jorge Gutierrez has signed a multi-year contract with the Brooklyn Nets, general manager Billy King said Friday. Gutierrez signed a 10-day contract with the team March 6, then a second on March 16. Terms of his contract were not disclosed, but sources told FOX Sports Ohio the deal is not guaranteed beyond this season. The 6-foot-3 guard played and started 35 games for the Charge this season, compiling averages of 13.9 points, 6.9 assists and 5.7 rebounds. He is averaging 3.4 points in five games with the Nets in his first NBA season. That includes a season-high 10 points March 21 vs. Boston. In related news, Gutierrez was fined $15,000 on Friday for making excessive contact above the shoulders of Bobcats forward Cody Zeller. The incident occurred in the Bobcats’ win over the Nets on Wednesday. Gutierrez was assessed a Flagrant 2 foul and ejected. The Nets host the Cavs on Friday. Tipoff is 7:30 p.m. on FOX Sports Ohio.